We want to ensure that the children we work with are able to connect our workshops with different flavours of hope in their minds. Hope is not a Luxury. Crayons are. Crayons of Hope (aka CoH with love) is the culmination of a simple everyday thought - can we do something special for society? There are a large number of underprivileged children who are deprived of what we take as granted for our kids. Now, while there are many programs and efforts to provide and fill material gaps - like food, education, clothing and so on - creating hope is a luxury and remains an afterthought. And so are crayons. In the race to provide underprivileged children with their basic needs, crayons and colors are forgotten in favour of more pressing things. But think about it. Crayons are a great equaliser. My kid could be eating breakfast cereal while another would miss it. But my kid will use the same size, color of crayons to paint a tree. We started to think. Hope is about shades, colors, tints and imagination. Can we use crayons to create some in the minds of underprivileged children. And that is how we started CoH together with friends. Our journey so far has been amazing. Can a wax crayon create identity? Everything that is done in this world is done by hope: Martin Luther. Children in a CoH program are often starkly deprived from the joys of childhood - children without parents, sometimes from broken families, children who live in slums and all such young lives. CoH workshops are designed around our larger vision of bringing hope to them. Let us give you an example, the first workshop in a Level 01 CoH program is about making an identity card. Not the ones many of us wear around our necks or carry in our wallets. But these are postcard sized thin cardboards which suddenly get transformed with flowers, trees, drawings of people dancing and the sun when the children start making an identity card out of them with their crayons. And in all that colors and emotions, you would suddenly see a carefully etched out first name: Suraj, Raju, Shyam, Suchitra, Vijay, Pappu. For most children these identity cards are their first experience of writing their names surrounded by a depiction of their likes and their existence. Not their wants. And that is how perhaps we start creating the first flavour of hope - IDENTITY. We take off from this point. Three more workshops follow in the Level 01 program. They continue this energy, dripping hope and inspiration. The children have started believing in their dreams. 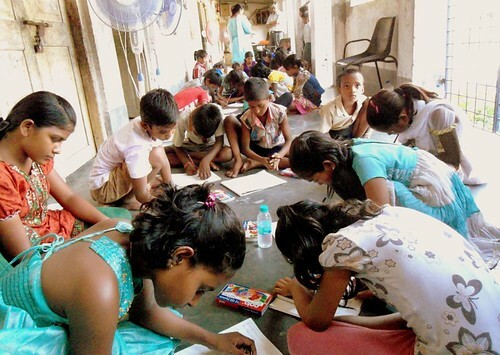 Today Crayons of Hope works with around 300 children in and around Kolkata in village schools, orphanages and slums. 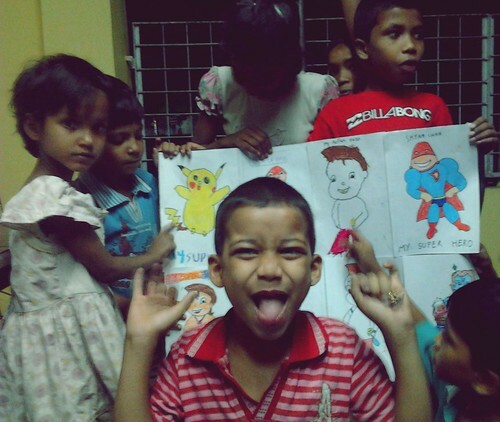 We work closely with three organizations working with underprivileged children. These organizations have become our anchors to reach out to more children. We currently run Level 01 programs, each program designed around 4 workshops. The first workshop triggers IDENTITY like we described above. The second one uses finger painting to tell them that anything is possible, you do not need much to paint - just colors and your fingers! 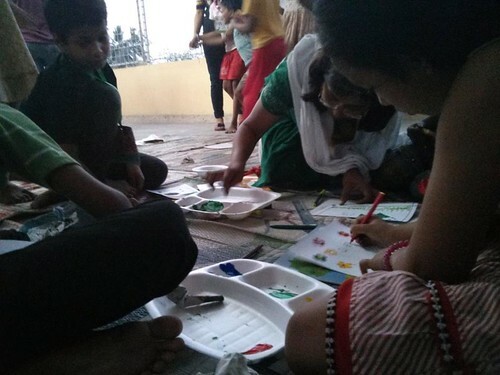 The third workshop is around teaching them to use colors to bring out their views on saving the environment. And finally the fourth workshop makes them draw cartoons about their super heroes. 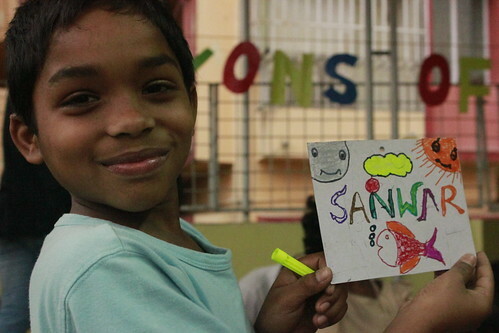 In 2014 we are running an ambitious mission to get children covered in our program to send a hand drawn postcard every month to another children in another part of the world. Each postcard is a hand drawn story of identity, hope and friendship. Postcards will follow different themes every month, 12 themes during the year. Learn more about this new mission on our new Crayons of Hope website. We are curious about whether what we do really creates hope in their minds or just creates huge dollops of fun. That they have :) We want to cover 1000 children this year. Hope is faith holding out its hand in the dark. We want to understand better what hope means so that we can make the connection with colors and our workshops stronger. Write to us and tell us what HOPE means to you. We will share a printout with your definition with one kid and ask her to write her own definition of hope below it. Of course she will use colors! You will receive a scanned picture of the whole page with both the definitions on your email.